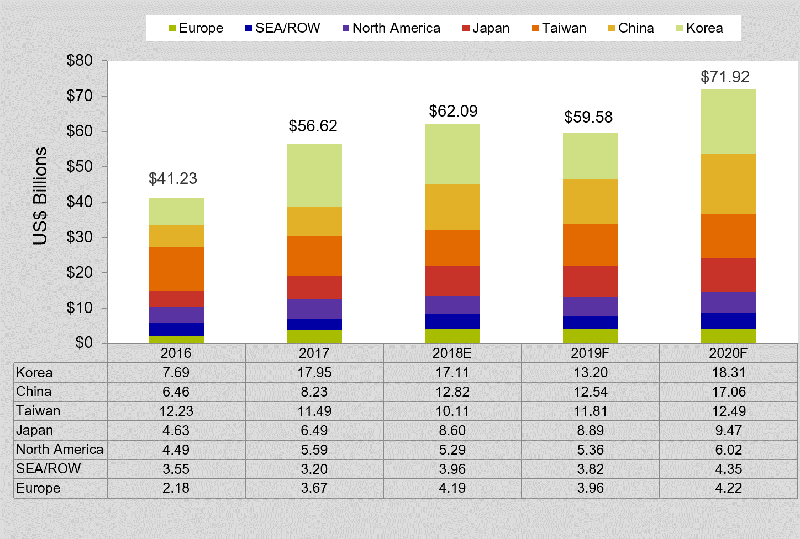 Resistive random access memory (ReRAM) and other emerging memory technologies have been getting a lot of attention in the past year as semiconductor companies look for ways to more efficiently deal with the requirements of artificial intelligence and neuromorphic computing. Neuromorphic applications are designed to specifically mimic how the human brain learns and processes information, and ReRAM devices show promise for enabling high-density and ultimately scaled neuromorphic architectures because they are significantly smaller and more energy-efficient than current AI data centers. They also mimic the brain’s biological computation at the neuron and synaptic level. Weebit Nano recently partnered with the Non-Volatile Memory Group of the Indian Institute of Technology Delhi (IITD) on a collaborative research project that will apply Weebit’s SiOx ReRAM technology to computer chips used for AI. [RRAM-Info] Weebit Nano was established in Israel in 2014 with an aim to commercialize a Rice University's SiOx RRAM technology. The company aims to show a "commercially viable" product by the end of 2017. In August 2016 Weebit Nano performed a reverse-merger with an Australian miner to become a public company (ASK:WBT). In September 2018 Weebit raised $2.16 million USD via a share placement. 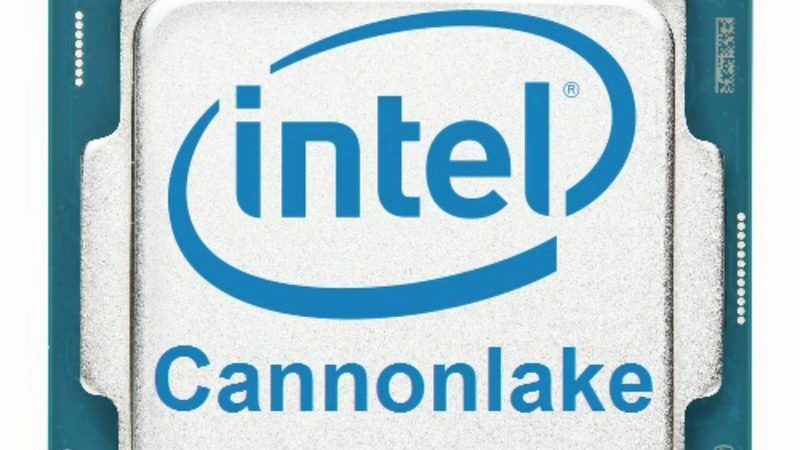 [TechInsight, LINK] TechInsights has found the long-awaited Cannon Lake - the Intel 10 nm logic process inside the i3-8121U CPU, used in the Lenovo IdeaPad330. Working together with external partners, chemists, materials scientists and chemical engineers at Friedrich-Alexander-Universität Erlangen-Nürnberg (FAU) have developed an innovative microcell for water electrolysis. They hope to replace standard plate electrodes used to split water into oxygen and hydrogen with compact, nanostructured tubes. They aim to simplify production, increase flexibility of use and avoid the need for expensive precious metals. A total of 2.5 million euros in funding has been earmarked for the 'Tubulyze' project which is due to start in early 2019 and is planned to run for four years. All-inorganic perovskite quantum dots suffer from poor stability in a humid and heat environment. In this article, CsPbBr3 quantum dots (CsPbBr3 QDs) are stabilized by coating nanoscale alumina on a CsPbBr3 QDs-silica luminescent sphere (CsPbBr3 QDs-SLS) via atomic layer deposition (ALD). Utilizing the intrinsic reactivity differences toward precursors, the surface defect sites of CsPbBr3 QDs are selectively passivated. The inorganic alumina coating layers can effectively reduce the ion migration and crystal deformation of CsPbBr3 QDs. In situ quartz crystal microbalance measurements show that organic ligands remain attached to the CsPbBr3 QDs surface during the ALD coating process. NMR, XPS, and first-principles calculations are performed to reveal the interaction strength between CsPbBr3 QDs-SLS and precursors. The surface passivation of alumina on CsPbBr3 QDs-SLS effectively stabilizes the QDs without reducing the photoluminescent quantum yield. Reprinted with permission from Chem. Mater., 2018, 30 (23), pp 8486–8494. 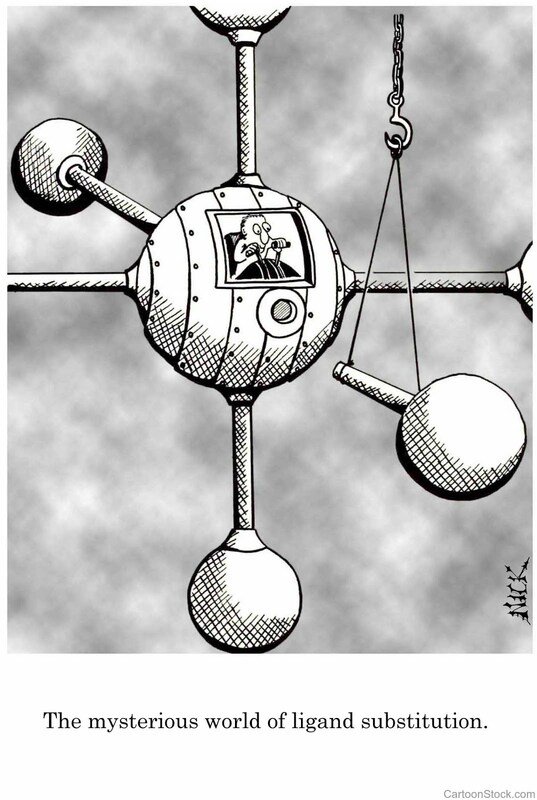 Copyright 2018 American Chemical Society. The semiconductor industry has already begun using cobalt to reduce contact and middle of line resistance. Replacing tungsten contacts with cobalt has paid dividends with an approximate 60 percent improvement in contact line resistance. Replacing the short-length copper interconnect at the lowest metal contact layers with cobalt has reduced via resistance (for lower IR drop) and improved electromigration reliability. New materials of interest include ruthenium and molybdenum, but both still lag cobalt from a maturity perspective. However, a detailed analysis of line resistance scaling shows that copper is superior or adequate to CDs of 12-15nm. Therefore, for metal levels above M1, where the interconnect is long enough for line resistance to be the key performance factor, copper wins. Integrating cobalt is not trivial, but Applied Materials has developed an “Integrated Materials Solution” for cobalt whereby the multiple process chambers needed to integrate cobalt can be combined into the same Endura platform, allowing wafers to be kept in vacuum for pristine materials engineering at ever more critical dimensions. Here is a cool video for TU Eindhoven on Area-selective ALD with high selectivity just publishe in their AtomicLimits blog "Towards Area-Selective Atomic Layer Deposition with High Selectivity – Our perspective on area-selective ALD" by Adrie Mackus (LINK). ESPOO, Finland, 21st December 2018 – Picosun Group, a leading, global supplier of ALD (Atomic Layer Deposition) thin film coating solutions, has developed a groundbreaking method for biocompatible encapsulation of microelectronic body implants. Remote sensing and therapeutics through self-powered, wirelessly operating microimplants is an emerging technology that is finding a plethora of uses throughout the medical field. Some key examples are neural stimulation and diagnostics, blood glucose, blood pressure, intraocular and intracranial pressure measurements, and even artificial eyesight. These minuscule devices are typically implanted for extended periods of time (from several months to well over ten years), so encapsulation of their sensitive electronics against the corrosive environment inside the human body is crucial. Naturally, also the body has to be protected against possible inflammatory or rejection reaction caused by the implant. Traditional encapsulation materials, mostly used for macroscopic objects such as pacemakers or Cochlear devices, include titanium metal, ceramics, and several polymers such as parylene or polyimide. However, when the implant size diminishes, and the requirements for the implant lifetime increase, novel encapsulation methods and materials are called for. ALD is an ideal method for reliable, hermetic encapsulation of various implantable devices, from micro-scale sensors to more macroscopic items such as hip, knee, and dental implants. 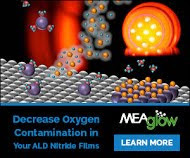 Several ALD materials are intrinsically biocompatible and inert in the human body. ALD method produces ultra-high quality thin films, that cover uniformly and conformally even complex 3D-structures with nanoscale details, thus the desired effect of the coating can be achieved with much thinner material layers compared to the traditional methods. ALD coatings can be applied at relatively low temperatures, which advocates their use also on sensitive materials such as plastics and polymers. Picosun has now developed an ALD nanolaminate encapsulant that can potentially ensure microimplant lifetime of over 10 years in human body environment(*). The nanolaminate deposition process is readily scalable to high throughput, cost-efficient industrial production of hundreds or even thousands of implants per run in PICOSUN™ P-300B or P-1000 ultra-large batch ALD reactors. Figure: SEM images showing conformal ALD nanolaminate on edges and corners of test Si pieces(*). “There is an increasing number of customers in the healthcare industries that are now looking at ALD to solve some critical issues in their products. We at Picosun have developed a whole family of production-proven, turn-key PicoMEDICAL™ solutions specifically to answer this need. 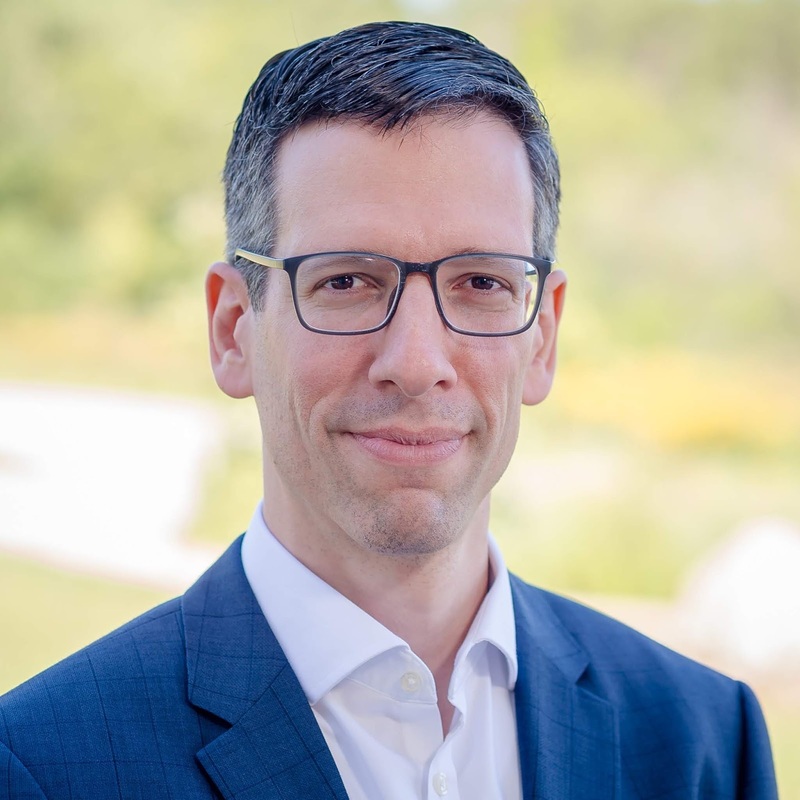 The excellent results of our ALD encapsulation for biomedical microimplants prove that our technological knowhow and decades of experience in the field are now paving the way for a whole new generation of ALD-enabled healthcare solutions,” says Dr. Jani Kivioja, CTO of Picosun Group. (*) J. Jeong, F. Laiwalla, J. Lee, R. Ritasalo, M. Pudas, L. Larson, V. Leung, and A. Nurmikko: Conformal Hermetic Sealing of Wireless Microelectronic Implantable Chiplets by Multilayered Atomic Layer Deposition (ALD), Adv. Funct. Mater. 2018, 1806440. DOI: 10.1002/adfm.201806440. DigiTimes report (LINK) that the Chinese OEM Advanced Micro-Fabrication Equipment (AMEC) announced recently its in-house developed 5nm plasma etching tools have been verified by Taiwan Semiconductor Manufacturing Company (TSMC). AMEC is already among TSMC's equipment suppliers for the foundry's 28nm, 10nm and 7nm processes. 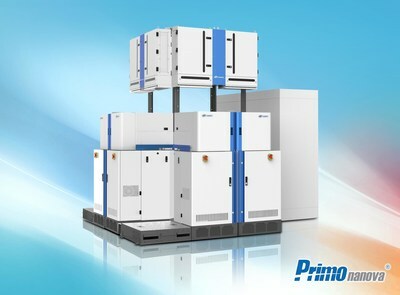 Earlier in 2018 AMEC Introduced the Primo Nanova® System, which is the Company's first ICP etch Product for Chipmakers' most advanced memory and logic (LINK). 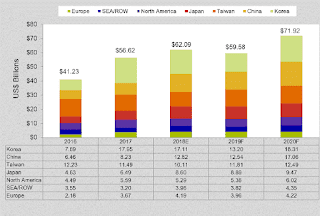 Besides ICP AMEC has products based on CCP etch and platforms for TSV Etch (LINK). 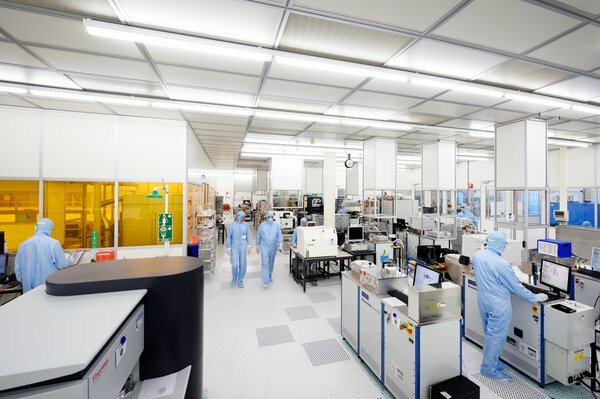 AMEC is China's leading provider of advanced process technology to global manufacturers of semiconductors and solid-state lighting (SSL) products. Headquartered in Shanghai, the company is an entrenched supplier of dielectric and TSV Etch tools, helping chipmakers build devices at process nodes as low as 7nm. To date, nearly 800 AMEC process units have been positioned at 40 leading-edge semiconductor fabs across Asia. The company is also well established in Europe with AMEC MEMS tools running in production at major IDMs. In addition, with its MOCVD system, the company helps SSL manufacturers build today's most advanced LED products. To learn more about AMEC, please visit www.amec-inc.com. Hello China, Japan, Taiwan, Singapore and Korea - Please update the ALD Thesis list! The fabrication of future sub-5-nanometer electronics requires etching with atomic level accuracy, which is beyond the reach of conventional plasma etching technology. In this project, novel plasma-based processes will be developed for layer-by-layer removal of material using atomic layer etching (ALEt). 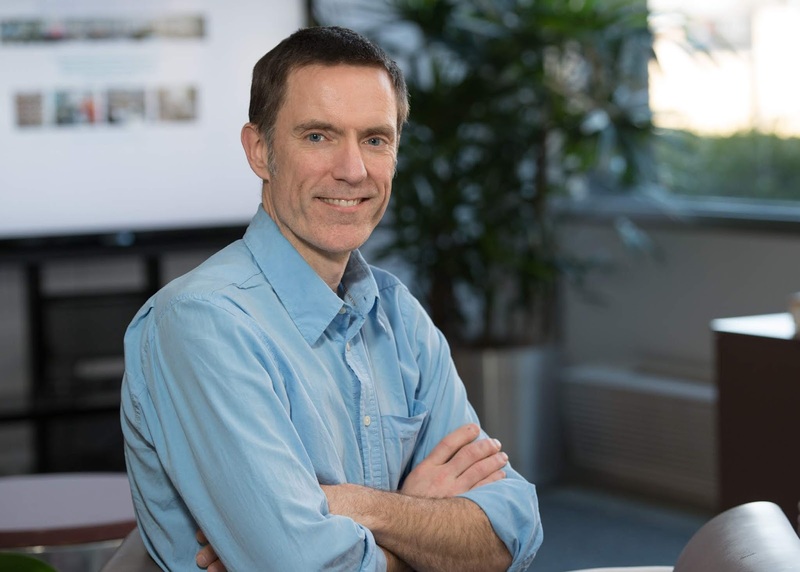 Adrie Mackus, leader of this project and Assistant Professor at the Plasma and Materials Processing group of Applied Physics, will collaborate with a diverse group of users from industry and academia, strengthening the leading position of the Netherlands in semiconductor equipment manufacturing. Nanolab@TU/e, a laboratory for nanotechnology research and innovation. Picture: Bart Van Overbeeke. For the ALD OEM market the situation is therefore heating up even though the. Currently the top 300 mm ALD equipment companies (ASM, TEL, Lam, Jusung, Wonik IPS, Applied Materials) does not actively support the market with pure play 200 mm products except for Large Batch Furnaces. So if you want a 200 mm single wafer ALD tool today you can buy a 300 mm tool and equip it with 200 mm handling or go to one of the smaller companies like Picosun, Veeco, Beneq, Oxford Instruments, which all have 200 mm ALD cluster products on the market today. 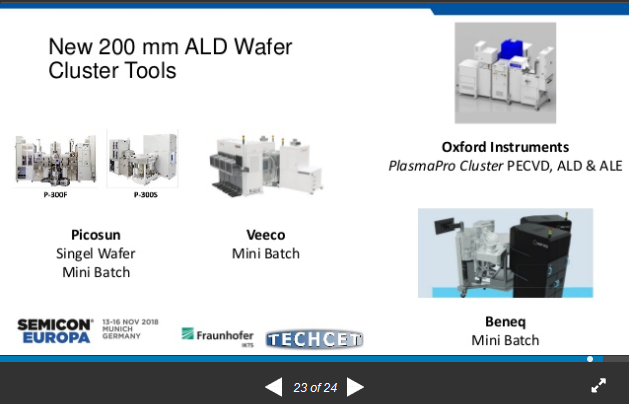 From presentation "ALD/CVD applications, equipment and precursors in high volume manufacturing" at SEMICON Europa 2018, available on SlideShare LINK. The 4th-annual Critical Materials Council (CMC) Conference will be held April 25-26, 2019 at the Saragota Hotel and Casino in Saratoga Springs, New York. 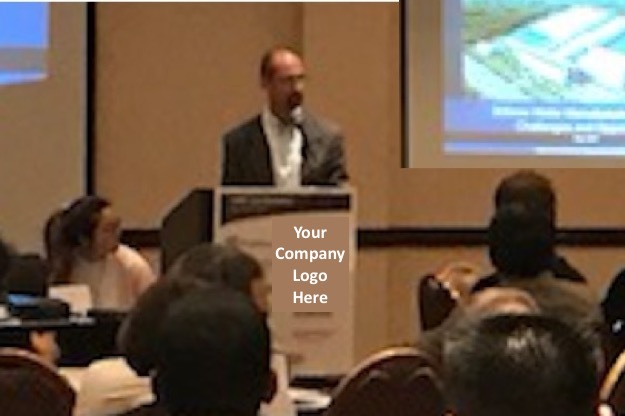 The public conference follows the private CMC Fabs F2F meeting and Members Joint Session April 23-24, at GlobalFoundries in Malta (near Saratoga Springs). 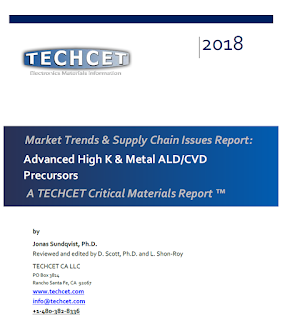 "Materials for Advancing Processes & Technologies"
"Materials Engineering in CMOS and Beyond-CMOS Applications"
"Slowdown: When did it start? What drove it? and When will the recovery come?" Powerful & actionable presentations, and the popular Not-so-unusual Round Table Session - a highly differentiated program, with networking opportunities for all attendees. 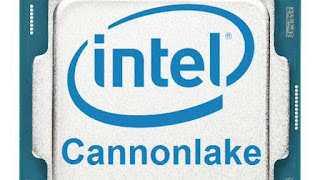 in the semiconductor industry. 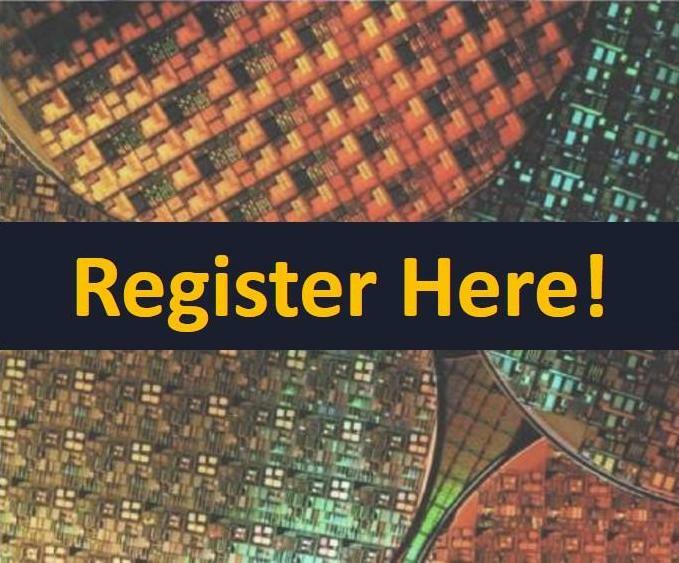 Use CMC Conference sponsorship as a pathway to leading semiconductor fabricators, OEMs, and materials suppliers. Sponsorships opportunities include virtual and in-person representation before, during and after the Conference, and may include active participation in our Not-So-Usual-Round-Table session. For more info go to https://cmcfabs/sponsorships/ or contact cmcinfo@techcet.com. Here is a cool animation on the Lotus High Speed Batch Atomic Layer Deposition using Vortex ALD. We report superior gas sensing properties of nano-layered atomic layer deposited - tin oxide thin films with room temperature operation and discuss the role of thickness on the sensing response of the films. 25, 50, 100 cycles of tin oxide ALD films have been evaluated for response with ozone gas in the concentration range of 25ppb-100ppb. At 75ppb of ozone, relevant concentration indicated for an Asthma attack, a remarkable increase in sensitivity by 22 times is seen with the 50 cycles ALD SnO2 sensor over the 100 cycles sensor and an increase of 58 times, with the 25 cycles sensor over the 50 cycles sensor. The operating power per sensor was under 200uW including the power consumed by an UV LED (385nm wavelength) used for resetting the sensors’ baseline resistances. 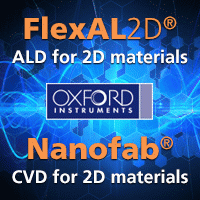 [Oxford Instrument News] Oxford Instruments NanoScience is pleased to announce a partnership with the leading European institutions, including renowned research groups from Germany, France, Spain, Finland, and Portugal. The group is led by the Walther-Meißner-Institute (WMI) of the Bavarian Academy of Sciences and Humanities in Garching, Germany on a European project for developing new quantum applications. The collaborative consortium awarded a three million Euro grant from the EU Quantum Flagship Programme, for the proposal on ‘Quantum Microwaves for Communication and Sensing (QMiCS)’. 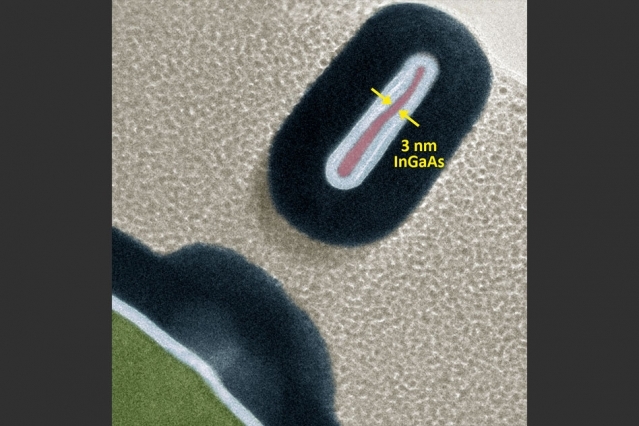 QMiCS aims at creating a technological basis for improving communication and sensing methods by employing dedicated micro- and nano-structured circuits, made from superconducting materials, cooled down close to absolute zero temperature to generate microwave radiation exhibiting a particular quantum mechanical property called ‘entanglement’. Exploiting entangled microwaves, a prototype quantum local area network cable for distributed quantum computing and a proof of concept for quantum-enhanced radar shall be demonstrated at WMI within the next three years. Oxford Instruments’ role will be to develop a cryogenic link between two ultra-low temperature fridges one provided by Oxford Instruments NanoScience and the other by the WMI to facilitate the microwave communication at very low temperatures. “We are excited at the potential of developing the next generation of quantum technology tools in association with such leading EU researchers in a consortium led by WMI to enable new innovative applications, using the company’s well established and diverse experience in superconducting and cryogen free ultra-low temperatures”, said Ziad Melhem, the Strategic Business Development Manager from Oxford Instruments NanoScience. [Leadmicro News] The University of New-South Wales (UNSW) in Australia, and Jiangsu Leadmicro Nano-Equipment Technology Ltd. (LEADMICRO), a China-based global manufacturer of advanced thin film deposition and etch equipment, have announced a partnership to develop the next generation high-efficiency solar cells based on novel Atomic Layer Deposition (ALD) technology within the frame work of an Arena Project entitled “Advanced high-efficiency silicon solar cells employing innovative atomic scale engineered surface and contact passivation layers”. Mr Warwick Dawson, Director of Knowledge Exchange, Prof. Mark Hoffman, Dean of Faculty of Engineering, Prof. A/Prof Bram Hoex of School of Photovoltaic and Renewable Energy Engineering, as well as Mr. Yangqin Wang, Chairman of the LEAD Group and Dr. Wei-Min Li, CTO of LEADMICRO witnessed the signing ceremony. Left to right: Research Fellow, Ouyang Zi; Chairman of Wuxi Lead Intelligent Equipment Co. Ltd., Mr. Yanqing Wang; CTO of Jiangsu Leadmicro Nano-Equipment Technology Ltd., Dr Wei-Min LI; Director Knowledge Exchange at UNSW, Warwick Dawson; Dean of Engineering at UNSW, Professor Mark Hoffman; Associate Professor Bram Hoex. The photovoltaic industry is currently amid the transfer to the technologically superior PERC technology which was developed at UNSW in the late 1980s. According to A/Prof Bram Hoex, who leads the project at UNSW, “A major part of the advantages of the PERC solar cell compared to the incumbent technology is due to the application of ultrathin films which reduce the electronic losses at the non-contacted areas at the rear of the silicon solar cell. It is generally accepted that the next technological node will use so called “passivating contacts” which simultaneously allows for low electronic and resistive losses. These passivating contacts typically consist of a combination of ultrathin films, thus we see that nanoscale thin films will play an increasingly important role in solar cells. ALD allows controlling the growth of thin films at the atomic level and therefore is ideally suited for making these contacts.” In this project, Leadmicro will donate a pilot-scale ALD reactor to UNSW which will be housed at its Solar Industrial Research Facility (SIRF) at UNSW’s Kensington campus. “The fact that we will have a high-throughput reactor available on campus will allow us to very quickly transfer the processes we develop at the lab-scale tools and test their performance at the solar cell device level, so the technology is ready for Leadmicro’s clients to use in high-volume manufacturing” says A/Prof Hoex. UNSW Dean of Engineering Prof. Mark Hoffman said: “UNSW leads the world in photovoltaic research and development, and I am very pleased that Leadmicro has chosen to partner with us. Together we will drive further efficiencies in solar cell technology. Collaborations such as this one between researchers and industry, where prototypes can be tested before being placed into full-scale production, are crucial to driving the economic benefits of discoveries. I am thankful to Leadmicro for their support and look forward to seeing the outcomes of this partnership,” Professor Hoffman said. “Leadmicro’s proprietary ALD technology has become the mainstream choice for mass production of high-efficiency solar cells based on passivated contact technology, we are excited to partner with world leading solar energy research center at UNSW to spearhead the development of ALD technology for next generation silicon based solar cell manufacturing that’s above 25% conversion efficiency.” says Dr. Wei-Min Li, CTO at Leadmicro. “In the past two years Leadmicro has made significant contribution to global solar industry with world leading ALD technology that enabled higher efficiency with significant cost reduction. 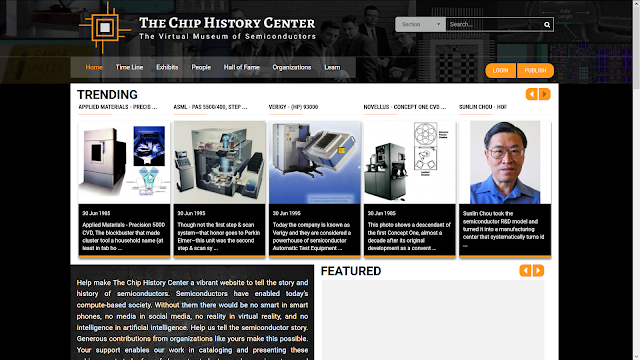 Leadmicro is an example of new trend of Chinese company that is strived for technology innovation and localization. 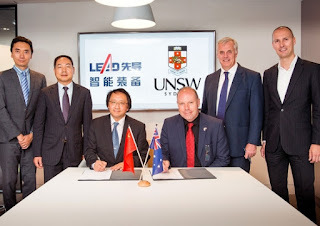 I’m happy to see the collaboration between Leadmicro and world leading research organization at UNSW to pioneer the new technology for high-efficiency solar cells production and contribute further to our noble endeavour of renewable energy for a clean world.” Says Mr Yang Qin Wang, Chairman of the Lead Group. The University of New South Wales (UNSW) is an Australian public research university located in the Sydney suburb of Kensington. Established in 1949, it is ranked 4th in Australia, 45th in the world, and 2nd in New South Wales according to the 2018 QS World University Rankings. UNSW has been a world-leader in the field of photovoltaics for over four decades. Jiangsu Leadmicro Nano-Equipment Technology Ltd is a global equipment manufacturer specialized in development, design, manufacturing, and services of the advanced thin film deposition and etch equipments for industrial production applications. Leadmicro’s business areas cover a wide range of industries including new energy, flexible electronics, semiconductor, and nano-technology. [MIT News] Researchers from MIT and the University of Colorado have fabricated a 3-D transistor that’s less than half the size of today’s smallest commercial models. To do so, they developed a novel microfabrication technique that modifies semiconductor material atom by atom. As described in a paper presented at this week’s IEEE International Electron Devices Meeting, the researchers modified a recently invented chemical-etching technique, called thermal atomic level etching (thermal ALE), to enable precision modification of semiconductor materials at the atomic level. Using that technique, the researchers fabricated 3-D transistors that are as narrow as 2.5 nanometers and more efficient than their commercial counterparts. or other LCO based systems, you owe it to yourself and your customers to contact Forge Nano and investigate their exciting advancements for your applications. 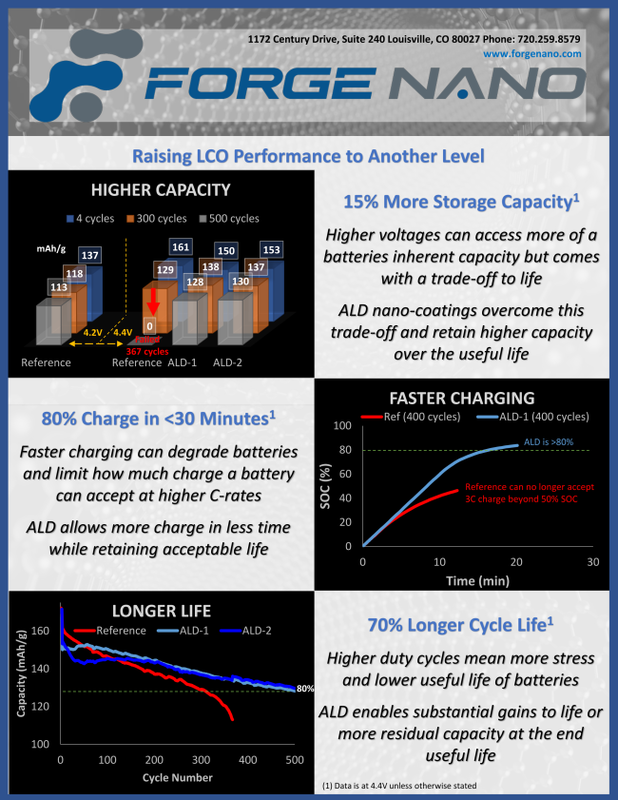 If you don’t use LCO based batteries, Forge Nano has demonstrated similar performance improvements for other battery chemistries as well. Forge Nano’s unique precision ALD nano coating process benefits extend well beyond battery materials, virtually any powder can be upgraded using their process. The EFDS ALD for Industry 2019 Exhibition in Berlin is growing - Come and join us 19-20 March 2019! The following HERALD members have been elected as the Grant Committee, starting in 2019, with responsibility for allocating grants for workshops and other networking purposes in the new HERALD network. A manufacturing technique that could help the semiconductor industry make more powerful computer chips began in the humblest of places — at a lunch table at the U.S. Department of Energy’s (DOE) Argonne National Laboratory. The materials synthesis method known as sequential infiltration synthesis, or SIS, has the potential to improve not only chip manufacturing but also things like hard drive storage, solar cell efficiency, anti-reflective surfaces on optics and water-repellant car windshields. Invented in 2010 during a lunchtime conversation between Argonne scientists Seth Darling and Jeffrey Elam and two of their postdoctoral researchers, use of the method has grown in recent years. 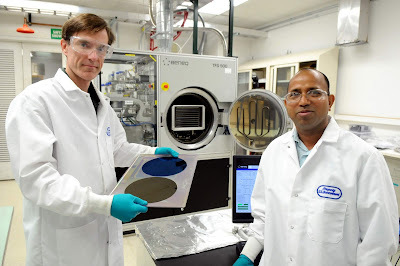 Top: Jeff Elam and Anil Mane, co-inventor on the SIS for lithography method and Principal Materials Science Engineer in Argonne’s Applied Materials Division. Bottom: Silicon wafers, ranging in size from 4” to 12” diameter, that have been treated using Argonne’s sequential infiltration synthesis method (Credit : Argonne National Laboratory). The method was based on the group’s discussion of atomic layer deposition, or ALD, a thin film deposition technique that uses alternating chemical vapors to grow materials one atomic layer at a time. Darling, director of the Institute for Molecular Engineering at Argonne and the Advanced Materials for Energy-Water Systems Energy Frontier Research Center, recently used that technique to add a water-loving metal oxide coating to filters used in the oil and gas industry which prevents the filters from clogging. But as the group talked, they started speculating about taking ALD to a new level, said Darling. The research was funded by the DOE Office of Science, Basic Energy Sciences Program as well as the Argonne-Northwestern Solar Energy Research Center, a DOE Office of Science-funded Energy Frontier Research Center. 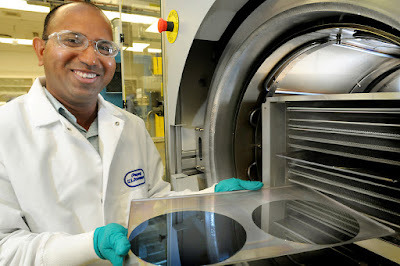 Anil Mane unloding wafers processed in a BENEQ TFS 500 ALD reactor at Argonne’s Applied Materials Division. (Credit : Argonne National Laboratory). SIS is similar to ALD on a polymer surface, but in SIS the vapor is diffused into the polymer rather than on top of it, where it chemically binds with the polymer and eventually grows to create inorganic structures throughout the entire polymer bulk. Using this technique, scientists can create robust coatings that can help the semiconductor manufacturing industry etch more intricate features on computer chips, allowing them to become even smaller or to add extra storage and other capabilities. They can also tailor the shape of various metals, oxides and other inorganic materials by applying them to a polymer with SIS and then removing the remains of the polymer. The technology’s potential spans beyond semiconductors. It could be used to advance products in different industries, and Argonne would be delighted to work with commercialization partners who can take the invention and incorporate it in existing products - or invent new applications to benefit U.S. economy, said Hemant Bhimnathwala, a business development executive at Argonne. “You can use SIS to create a film, you can put it on a metal, you can create this on glass or put it on a glass windshield to make it water repelling to the point where you don’t need wipers,” Bhimnathwala said. The way the scientists invented the technique — through that lunch meeting — was also a bit unusual. New discoveries often come about by accident, but not usually by spitballing ideas over lunch, Elam said. The technique also addresses a specific concern in the semiconductor manufacturing industry, pattern collapse, which means the collapse of tiny features used to create electrical components on a computer chip, rendering it useless. When a pattern is etched on a silicon chip in the chip-making process, an etch-resistant surface is used as a protective coating to mask those regions you do not want to remove. But the etch-resistant coatings commonly used today wear away very quickly, which has prevented chip manufacturers from making components with deeply etched features, Darling said. With SIS, inorganic vapor coatings can be engineered to provide greater protection of vertical features, allowing deeper etches and the integration of more components on each chip. Similarly, the technique can be used to manipulate magnetic recording on hard drives or other storage devices, allowing them to increase storage while also getting smaller, Darling said. Another possibility for the technology is to control how much light bounces off a glass or plastic surface. Using SIS, scientists can engineer surfaces to be almost entirely non-reflective. Using this strategy, scientists can improve performance of solar cells, LEDs and even eyeglasses. The team’s research on the technology has been published in The Journal of Materials Chemistry, The Journal of Physical Chemistry, Advanced Materials and The Journal of Vacuum Science & Technology B.
Argonne is looking for commercial partners interested in licensing and developing the technology for more specific uses. Companies interested in leveraging Argonne’s expertise in SIS should contact partners@​anl.​gov to learn more and discuss possible collaborations. Top: Seth Darling, Scientist and Director of the Institute for Molecular Engineering at Argonne National Laboratory. Bottom: Jeff Elam, Senior Chemist in Argonne’ Applied Materials Division (bottom). Picture Credit : Argonne National Laboratory. Here is a recent paper shared by Henrik Pedersen on twitter using a cool rather huge ALD machine for coating covered here earlier (LINK) during its start up at University of California, Santa Cruz. 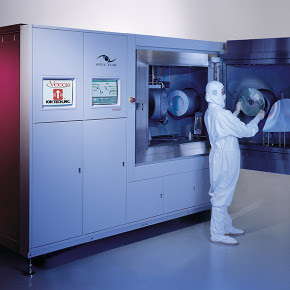 The reactor with a 1 m wide ALD process chamber that has been designed and built by Structured Material Industries Inc. (LINK). 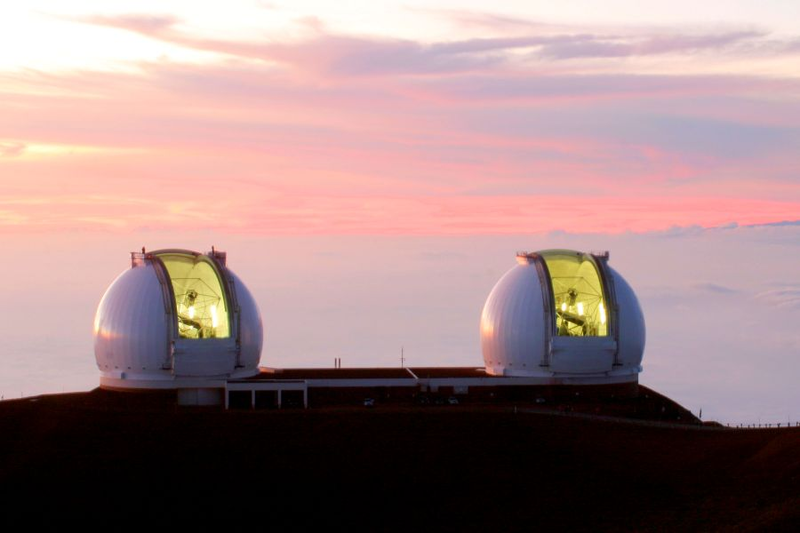 It is large enough to accommodate telescope mirrors that has been refurbished with a silver coating that needs a perfect protective ALD coating. 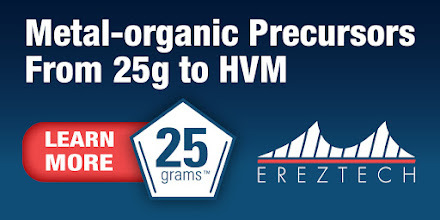 The initial test shows that lateral thickness uniformity across a 0.9 m substrate is within 2.5% of the average film thickness, and simple steps to realize 1% uniformity have been identified for next growths. PLAINVIEW, New York—Nov. 29, 2018—Veeco Instruments Inc. and Gooch & Housego (G&H), the world’s leading supplier of high quality superpolished optical components today announced the successful installation of Veeco’s SPECTOR® Ion Beam Sputtering (IBS) Optical Coating System at G&H’s Moorpark, Calif. facility. The new capability provided by SPECTOR supports G&H’s expanding portfolio of high-quality optics for ultraviolet, visible and infrared systems used in telecommunications, aerospace and defense, life science and industrial applications. SPECTOR offers exceptional layer thickness control, enhanced process stability and the lowest published optical losses in the industry, and has become the IBS system of choice for over 200 advanced manufacturing settings worldwide. G&H will use this system to support its expanding portfolio of high-quality optics for UV, visible and infrared systems used across telecommunications, aerospace and defense, life science and industrial applications. The SPECTOR IBS platform offers exceptional layer thickness control, enhanced process stability, and the lowest published optical losses in the industry. The system is engineered to improve key production parameters, such as target material utilization, optical endpoint control, and process time for cutting-edge optical coating applications. The SPECTOR platform, which is the preferred IBS system in the industry, has been installed in more than 200 advanced manufacturing settings across the world.